Did You Know You Are Not Of This World? When this world feels less like home than it once did, it may be because your heart is longing even more for where your real home resides. Karlton explains. “Jesus said, ‘My kingdom is not of this world. If it were, My servants would fight to prevent My arrest by the Jewish leaders. But now My kingdom is from another place’” (John 18:36). There is truth to that. Not about redheads, but about all of us who are born again children of God. We are not of this world, we were born again for better things. 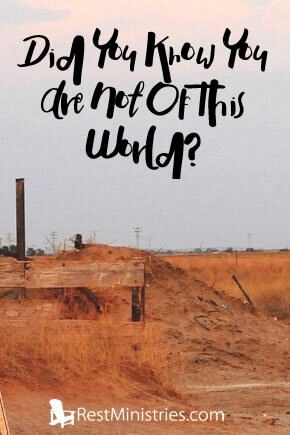 This world is not our true home. Even on our best days down here we intuitively know that there is more to life than our present circumstances. Even when everything is going well, we have a sense that something is not altogether right with this world. For those of us with ongoing health issues, we are more than aware that this is not God’s best for us, that better things are coming. One day we will be complete–without any health problems, pain or suffering, or any grief-laden tears. One day we will be in our true home, wearing our supernatural body, with joy and bliss we could not even imagine in this life. Jesus has prepared a place for us, and a resurrection is coming for us all. If life has made you miserable and unhappy in your current circumstances, know that you are not alone, there are millions of Christians waiting for something better, waiting for our true home. Prayer: Dear Lord, we suffer and are often unhappy down here. Let us never forget that this is not our home, but You have prepared a place for us. Amen. Karlton Douglas lives in Ohio with his lovely wife, life has brought him many challenges, yet he knows it will make him appreciate his true home better one day. Do you often feel out of place, in a hostile environment? It is because you are not of this world, and are destined for better things. 4 Responses to Did You Know You Are Not Of This World?